Mitsuhashi Kanichiro was a kendo master of the early 20th century. Pulling again from Kenji Tokitsu’s book on Miyamoto Musashi, I find an interesting and applicable understanding of Musashi’s philosophy. – Do not over-stretch to the point of losing flexibility and the ability to spring into action. – A skilled practitioner does not have a lapse in their flowing mind and they immediately know how to take advantage of an opponent who does. – Begin your combat with calm energy and deliberate movements. Do not be agitated and waste your energy. – Even though you should command the initiative, rhythms or cadences will depend on your opponent. – Master the three keys of the human being, (Kanichiro describes them as “domains”): mind (心), will or energy (氣), and body (身). – Fear hinders courage and stimulates the will of your opponent. – Hold your body “accentuating its central axis” The belly is forward and the entire body is dynamic. – If you are too skeptical you will be mired in doubt and never go beyond. 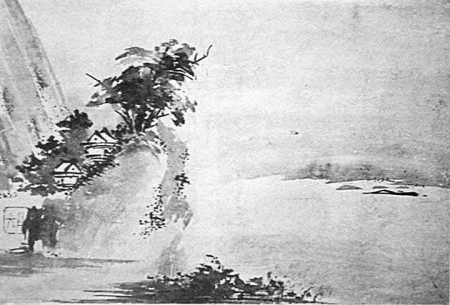 Within Kanichiro’s work is a poem by Musashi which reflects his school with the notion of water in winter evoking the coldness of a blade and the clearness of the mind. The water flows, never stagnating. Transparent yet reflecting the moon.